This blog provides readers of Principles of Payroll Administration: The Complete Learning and Reference Guide, a convenient way to ask questions, make comments and stay connected with recent developments. Principles of Payroll Administration, published by Thomson Reuters/WG&L is the original comprehensive learning guide written by and for payroll professionals and those who support the payroll function. The product of over 28 years of development and continuous updating to meet the constantly changing demands of the payroll profession, Principles of Payroll Administration: The Complete Learning and Reference Guide addresses topics of vital significance to payroll practitioners and answers the most frequently asked questions. 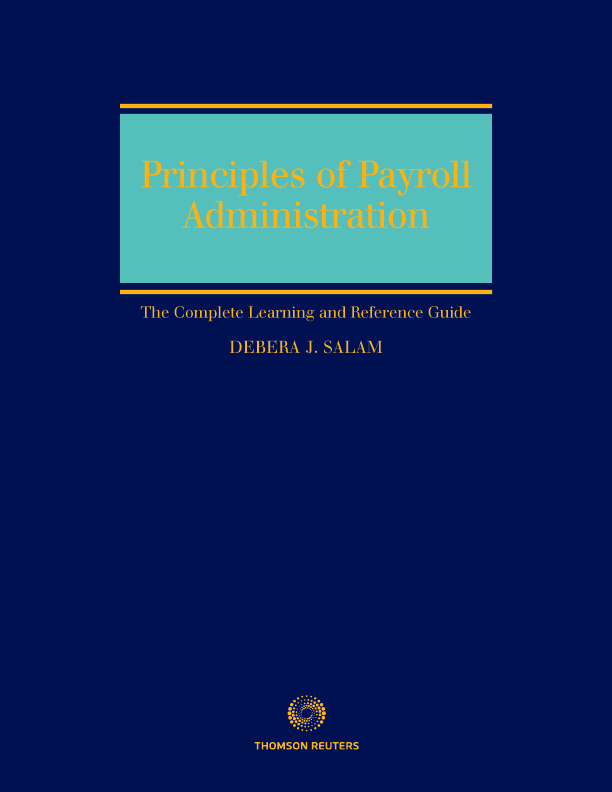 Principles of Payroll Administration: The Complete Learning and Reference Guide is a dual-purpose book. It is designed to satisfy organizational and personal training requirements as well as technical reference needs. Intended for readers at all levels of professional experience and expertise, this book blends a historical perspective on the public policies and laws affecting payroll with a full explanation of the subject matter, using a building-block approach to guide the reader from the basic principles through complex applications of the material. This approach offers readers a logical progression of understanding—regardless of the level of expertise. This book also includes chapter quizzes, practice tests, tips for preparing for the Certified Payroll Professional (CPP) and Fundamental Payroll Certification (FPC) exams, a dictionary of terms and acronyms to enhance its reference and training value, a comprehensive index, a listing of all charts and exhibits, and a year-end update to retain its reference value throughout the year. Principles of Payroll Administration: The Complete Learning and Reference Guide was developed with the input of payroll practitioners and reviewed by a qualified staff of technical editors and consultants to ensure its accuracy. In our continuing effort to expand and improve this publication, we welcome your comments and suggestions. The information contained herein is general in nature and is not intended, and should not be construed, as legal, accounting or tax advice or opinion by any of the contributors. The reader is also cautioned that this material may not be applicable to, or suitable for, the reader’s specific circumstances or needs, and may require consideration of non-tax and other tax factors if any action is to be contemplated. The reader should contact his or her tax or legal professional prior to taking any action based upon this information. The contribututors to this blog assume no obligation to inform the reader of any changes inx laws or other factors that could affect the information contained herein. Copyright 2013. Debera Salam, unless otherwise noted. All rights reserved. The administrator and contributors to this blog are not responsible for web links that are contained throughout. I used the Payroll of Principles to pass the CPP exam in 2014. I believe the quizzes and test helped me to really focus in areas where I struggled in. Along with tha Payroll Source book, this book sits on my desk as a great reference. Please continue to print this great reference book ever year. I will purchase one every year.